Actors Im Ji-gyu, left, and Seo Hyeon-jin star in a scene from Ku Hye-sun's feature film debut "Magic." The tragic teen romance premiered at the 11th Jeonju International Film Festival (JIFF) and features songs written and performed by Ku. It will be released in theaters on June 24. It’s no doubt that Ku Hye-sun is talented. And ambitious. The popular actress has displayed her prolific talent by holding a solo art exhibition, penning a novel and foraying into music, releasing an album and performing with the renowned Japanese artist Isao Sasaki. In 2008, she made her directorial debut with a short film, “Yukwehan Doumi” (Happy Helper), which screened at local and Japanese film festivals. The 25-year-old brings to local theaters her first feature film “Magic,” which premiered at the 11th Jeonju International Film Festival. Also the first film to be produced by the entertainment giant YG, the project fits in the genre of much-loved “music movies” here, though with a more art house cinema sensibility ― or at least it tries to. Ku trips many times in her attempt to create a Proustian montage of music-heavy images, and the viewer is left with the palpable sense of lost time, quite literally (a good hour-and-a-half to be exact though it actually feels longer). And this comes from someone who will sit through almost any experimental film. But what can you say? A convincing audiovisual search for le temps perdu is often difficult to achieve unless you’re Wang Kar-wai. The film, however, wasn’t invited to Asia’s largest indie film event for nothing. It boasts impeccable production values ― in spite of being a low-budget enterprise ― and displays promise of Ku’s capacity as a filmmaker. Moreover, its lead actor Im Ji-gyu, the little prince of hit indie flicks “Milky Way Liberation Front” and “Who’s That Knocking at My Door?” will save the film from sinking into complete oblivion, while newcomer actress Seo Hyeon-jin peppers the soundtrack with her lilting voice. The tracks include an eclectic array of songs from the folksong “Arirang” to Bizet’s operatic arias and original crossover pieces by Ku. “Magic” is basically a teen love triangle gone awry, and the protagonist is still haunted by the puppy romance decades later. The premise works in a way since first loves, usually experienced during adolescence when the sight of a single falling leaf inspires tears, last forever. But it must also be said that it took a while, in spite of the uniforms, for this viewer to realize that the story is set in high school, since all three of the lead actors, save for the baby-faced Im, are older than Ku. The film is set in an arts high school in the not-so-distant past. Kim Jeong-wook, the bad boy of teen TV soaps, stars as a cellist equipped with perfect pitch, good looks and a nasty habit of chain smoking. Perhaps Ku had been trying to create an amiably rude artist like Kim Myung-min’s Maestro Kang from “Beethoven Virus,” but Jeong-wu is merely a narcissistic bully that likes to show off his gift. Musicians may be offended to see him commit such heresy as using an instrument, albeit a cheap practice one, as an ashtray. A victim of Jeong-wu’s bullish behavior is his diligent friend Myeong-jin (Im), who is often seen carrying both their cello cases and meal trays during lunch. 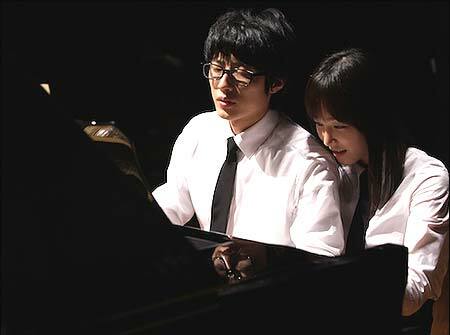 Caught in between the duo is the lovely pianist-composer Ji-eun (Seo). The two boys are both obviously infatuated with the girl, and they stand at a crossroads of friendship and artistic rivalry when they enter a music competition. Here the film suffers because substance is unfortunately compromised by focus on style ― everything from the set to antique furniture and small props is really, really pretty like one of Garosu-gil’s trendy shops. The camera aims to capture the subtle emotional dynamics between three teenagers, but ends up feeling more like another one of Korea’s typical melodramas that rant about unrequited love while not forgetting to dramatize the situation with tragic incidents.